Take a look at liberal arts degrees. Have you ever wondered what it is that makes us human, and have you sought to get an expanded understanding of the whole human experience? It may sound way esoteric and philosophical, but that’s basically what anthropology is: the study of man and the human experience. The word “anthropology” literally translates to the study of humankind. Anthropologists take into account the evolutionary history of humans, their behavior, and how they adapt, communicate, and socialize with their surroundings. Anthropology searches for a unique understanding into every single aspect of being human, from our beginnings through our constant state of development. Having any type of background in anthropology is useful to many professions. Iit gives you a sort of insight into human behavior, thus helping develop a deeper interpersonal skill set that is beneficial to many different career areas. Whether you’re headed into the medical field or business, classes in anthropology are a great addition to your coursework. Anthropology is a connection between our past and present. It is useful in answering the many questions related to where we, humankind, originated and where we are going. When it comes to the world stage, anthropologists from all four fields are crucial to better understanding the global market and all the moving pieces. For example, a business person traveling to another country is able to research the customs and cultures prior to visiting; this is due to anthropology. Or the study of the bones of the feet, from prehistoric remains to present day, shows us how we’ve evolved both physically and developmentally. The usefulness of anthropology is so profound, because it touches every single aspect of biological life. Anthropology has a wide range of studies, so it is broken down into four subtypes. What you’re interested in determines which of the four fields you’d study. If you want to become an anthropologist, expect to get your master’s degree or doctorate. If you’re still in high school and beginning to explore what it takes to become an anthropologist, it’s a good idea to bulk up on high school social science, physical science, and language skills classes. Those will give you a great head start! Once you’ve graduated from high school, it’s off to college where you’ll spend four years majoring in anthropology and archeology, presumably. You’ll start off with a bachelor’s degree before climbing the degree-ranks toward a master’s and then perhaps, a doctorate. In all honesty, to be competitive in the field of anthropology, a doctorate degree is the wisest choice. Internships are a requirement for anthropologist students; this is where you’ll obtain some of the necessary experience, plus make lasting connections. After you receive your master’s degree, you’ll be expected to conduct research, especially if going into medical anthropology. All disciplines of anthropology require fieldwork for their graduate programs. 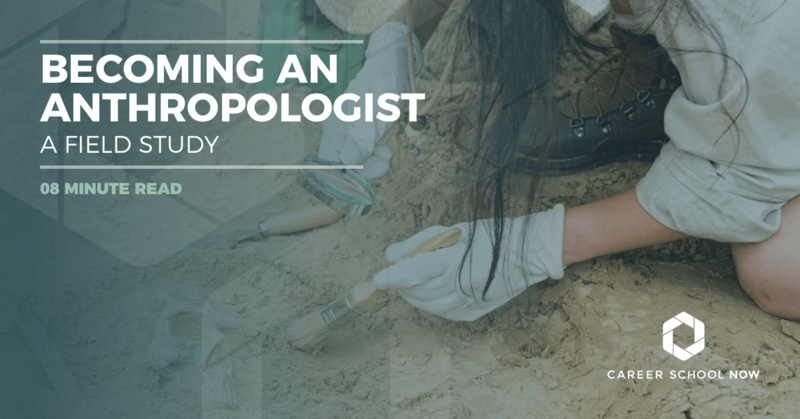 While you’re in school for your bachelor’s degree, you’ll have a chance to decide which of the four fields of anthropology and their subspecialties you want to focus your studies on. Not all colleges will expect you to declare your track, though. This will allow you to sample all that anthropology has to offer. You’ll take courses that introduce you to all the different fields of anthropology, as well as courses in language, animals, sexuality, societies, globalization, culture, violence, and foods. All colleges have similar curriculum, but the names of the courses may be different. Depending on what level of courses you’re taking will determine how detailed the class is, and what subjects are available. Schooling for anthropology takes the better part of a decade. By very definition, fieldwork is work done by students to gain practical insight through firsthand experience. Fieldwork to an anthropologist is like research to a scientist. It is necessary for anthropologists; it’s their form of exploration and investigation to get an erudite, fully-immersed look into whatever subject they are studying. It can take a year or longer to compile all the necessary data. It’s imperative for anthropologists completing their fieldwork to be thought of as a “native,” which can be time-consuming in and of itself. So, whichever field of anthropology you’re going into, expect to participate in fieldwork study that can leave you near your home or take you to an exotic location. There are a few different processes of fieldwork. Ethnography: This combines fieldwork and research. It can be time-intensive, requiring you to spend months or years participating in the community or culture you’re studying. Participant observation: Social anthropologists immerse themselves in the daily lives of the culture they are studying. Quantitative data: You’ll do your research through studies such as creating surveys, group interviews, oral histories, studying statistics, or analyzing records. Biological anthropologists use this to map out traits in a certain population. It’s also used when working with other anthropologists in other disciplines. Once your fieldwork is completed and you’ve collected all your data, you’ll either contribute to a professional journal, or write a report or an article. For anthropologists, there are four different paths your career can take you: academic, non-profit, corporate, or government. As an academic anthropologist, you’ll teach or work in a research laboratory. You’ll spend much of your time preparing for the classes you’ll be teaching, along with working with your students. You can work in market research on a corporate level using your well-rounded research skills to gain more insight into how to improve products for consumers needs. This is a growing field of anthropology. Working in the nonprofit sector, you may find yourself planning and carrying out programs. Working within the government, you’ll probably be a contract employee working in international development, cultural resource management, or forensic and physical anthropology. HOW MUCH DO ANTHROPOLOGISTS MAKE? In the United States, the average salary for anthropologists is over $63K. The bottom 10 percent earn an average of $37K, while the top 10 percent earn over $99K. Travel and irregular hours are par for the course in an anthropologist’s career. Jobs working with the federal government pay the highest, while research and development in the social sciences and humanities pay the least. A slower than average job growth is predicted for anthropologists and archeologists. Although, corporations are starting to hire more anthropologists so that they can have a better understanding into consumer behavior. Business and consulting firm opportunities for qualified anthropologists are expected to rise. To have a more competitive edge in this tight market, you should definitely have a PhD coupled with extensive fieldwork and experience. If you have strong analytical, investigative, and critical thinking skills, and you question “why” about everything around you, then you may want to explore a career in anthropology.